Elena PapandreouElena Papandreou was born in Athens on 7 March 1966. 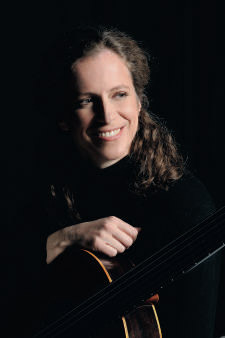 She studied the guitar with Evangelos Boudounis (with whom she received her diploma in 1985 from the National Conservatory with the highest mark) and with Oscar Ghiglia. She also studied with Gordon Crosskey at the Royal Northern College of Music, England, on a British Council scholarship, obtaining the Diploma in Advanced Studies in Musical Performance (1986). She played in master classes of Alirio Diaz, Julian Bream, Leo Brouwer and Ruggero Chiesa. She has won the First Prize in three International Competitions, “Maria Callas“ (Greece), “Gargnano“ (Italy), “Alessandria“ (Italy) and the Second Prize in the “Guitar Foundation of America“. In the latter she was also awarded the “NAXOS“ Prize, which gave her the opportunity to record two personal CDs with this company. In the past she had released five other records while now she collaborates with the Swedish BIS where she recorded two CDs (music by Nikita Koshkin and by Roland Dyens). In 1992 she was honoured by the Academy of Athens with the “Spyros Motsenigos“ Prize - a most important prize that is awarded to one outstanding performer every two years. Elena Papandreou has performed in most European countries, as well as in the U.S.A., Canada, Venezuela, Puerto Rico, Brazil, Mexico, Colombia and Japan. Within the “Rising Stars“ program of the “European Concert Hall Organisation“, she gave concerts in some of the most prestigious halls in Europe, the Vienna Musikverein, the Koelner Philharmonie, the Birmingham Symphony Hall and the Athens Concert Hall. She has also played in the Tchaikovsky Concert Hall in Moscow and the Queen Elisabeth Hall in London. In 1998 she gave her debut in Carnegie Hall in New York. She has collaborated with outstanding musicians, the guitarists Oscar Ghiglia, Alirio Diaz, Roland Dyens, Nikita Koshkin, Evangelos Boudounis, the violinists Leonidas Kavakos and Gerardo Ribeiro, the cellist Leonid Gorokhov, the singers Vasso Papantoniou and Herbert Lippert and the flutist Stella Gadedi. Elena Papandreou has played as a soloist with the State Orchestras of Athens and Thessaloniki, the Camerata Orchestra, the Orchestra of Colours, the Orchestra of Patras, the Orchestra of Alessandria, Italy, the Istanbul Chamber Orchestra, the Bucharest Philharmonic and the ESMDM orchestra in Monterrey Mexico. Performances of hers were recorded by the Greek Television and Radio, Radio France, Deutsche Welle and the Turkish Television. Elena Papandreou teaches at the University of Macedonia in Thessaloniki and in the summer course of Incontri Chitarristici di Gargnano in Italy together with Oscar Ghiglia. Composers who have dedicated their works to her are Nikita Koshkin (among others, a concerto for guitar and orchestra), Roland Dyens, Nikos Mamangakis (among others, a concerto for guitar and orchestra), Evangelos Boudounis, Giorgos Koumendakis and Dimitris Nicolau.